MISSION, KS--(Marketwire - Feb 21, 2013) - (Family Features) For those who enjoy preparing home-cooked, nutrient-rich meals, but are often pressed for time, canned foods are essential cooking tools. A well-stocked pantry, or "Cantry," ensures you always have healthful fruits and vegetables on hand -- no matter the time of year. "Cans' ironclad seal locks in freshness, flavor and nutrients, so you can rely on canned foods to create wholesome and delicious meals for your family," said Elizabeth Fassberg, MPH, RD, CDN, owner of EAT FOOD, a food and nutrition consultancy in New York City. "Cooking with canned food means you know what you're serving your family and helps cut down on eating out." Select fruits that are packed in their own juice, water or 100-percent fruit juice. 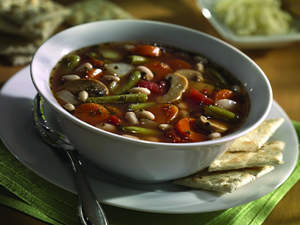 When possible, opt for canned vegetables or soups with no sodium added or low sodium products. If these options are not available, rinse the vegetables before you use them. Refrigerate leftover canned goods in a glass or plastic container. So if you're not sure what to make for dinner tonight, look no further than your "Cantry." For more recipes visit www.Facebook.com/CansGetYouCooking and www.Pinterest.com/CansGetUCooking. Heat oil in a large saucepan over medium-high heat. Add onion and sauté until transparent, about 2 minutes. Add garlic, Italian seasoning, savory and sage, and cook 10 seconds. Add broth, vegetable juice and vinegar, and bring to a boil. *Recipe and image courtesy of Mealtime.org.